Larry Garnett focuses on innovative, yet practical home design and New Urbanism for small-scale developers. A residential designer since 1977, Garnett has designed several national show homes, including "The Most Romantic Home in America" by Traditional Home Magazine. His book, Home Plan Doctor, was published in 2008. He also writes the monthly "House Review" feature for Professional Builder Magazine. His interest and experience in the New Urbanism has allowed him to be involved in the overall design of several "New Villages." This has created a demand from small builder/developers to provide design services for projects from 5 to 50 acres. In 2009 he was one of the first design professionals to become an Accredited Member of the Congress for the New Urbanism. 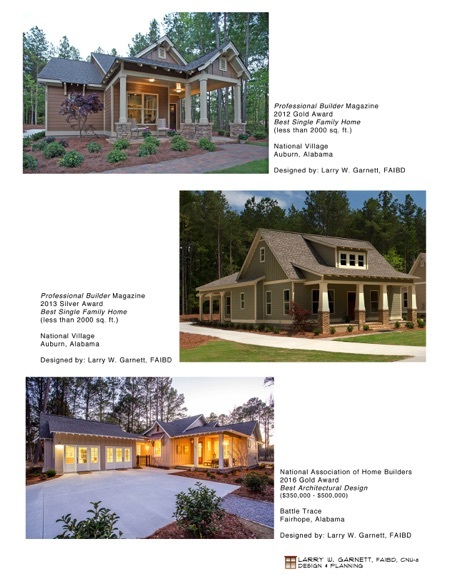 Garnett speaks frequently on home design and traditional neighborhood development at home & garden shows and venues that include Harvard University and the National Association of Homebuilders. He has been featured in media that includes Better Homes & Garden's Better TV Show, Martha Stewart Radio, Wall Street Journal TV, and House Smarts TV. His designs have been published in various magazines, such as Southern Living, House Beautiful, and Country Living. A certified Professional Building Designer, he was inducted into the American Institute of Building Design's College of Fellows (FAIBD) in 1996.